Could the future of aviation be something from decades in its past? Planes produce enormous amounts of carbon, so the search for a less polluting alternative is a pretty high prority to the scientific community. Professor Sir David King, former chief scientific adviser to the UK Government, believes that in the search for a cleaner form of travel, the airship, rather than the jet, is the future. While airships are much slower that jet aircraft, they can also carry a great deal more cargo - or passengers - and require much less fuel. King told the Guardian that major aerospace and defense companies like Boeing and Lockheed Martin are working on new airship designs. "There are an awful lot of people we talk to who say this is going to happen," said King. "This is something I believe is going to happen." King also said that airships could be fitted with cargo lifts so that they wouldn't need airports. This would save on the cost of transporting goods and could allow the airships to access more remote areas, like inland Africa. Airships were popular in the 1920s and 30s, but the Hindenberg disaster in 1937, which cost the lives of 35 people when the hydrogen keeping the craft aloft caught fire, shattered public confidence and caused airship travel to be effectively abandoned. Modern airships, however, are filled with inert helium, making that kind of disaster a thing of the past. 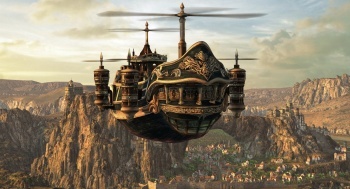 I must admit, I hope that airships do get used in the future. I don't really care about air freight, but I like the idea of going on a "sky cruise." After plenty of cramped flights, taking a little bit longer to get a load more room sounds very appealing indeed.